Spent the weekend in Southern Punjab for the Cholistan Desert Jeep Rally. It is an annual racing event organized by the Tourism Development Corporation of Punjab (TDCP) and draws in some of the meanest off-road vehicles from all over the country. 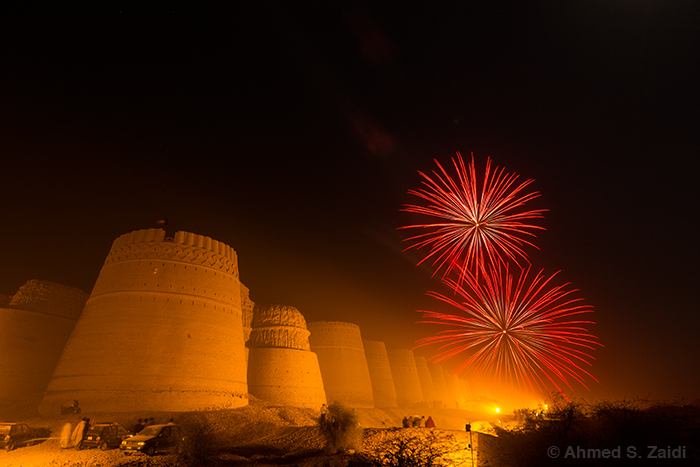 We were told that there would be a fireworks display at the historic Derawar Fort on the night before the final race. However, by 10pm nothing had happened and we assumed it was just a rumor. Just then, the fireworks started and we made a dash to capture them. Most people instinctively made a run towards the fireworks. My friend Xeeshan and I went further away and our efforts were rewarded with some amazing shots. I managed to swap out my mid-range zoom for an ultra-wide lens and caught this shot in the nick of time.